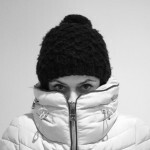 So… I’ve been scrolling through the ‘new-in’ stuff, and apologies in advance if any of it feels unseasonal… I can’t help it, it’s just what’s caught my eye this week! So I’m guessing you’ve realised that for the £36 price tag, these pumps are not made of leather. However, how cool are they?! They really take me back to my teens… except, these are way nicer than the ones I had back when I was 16! 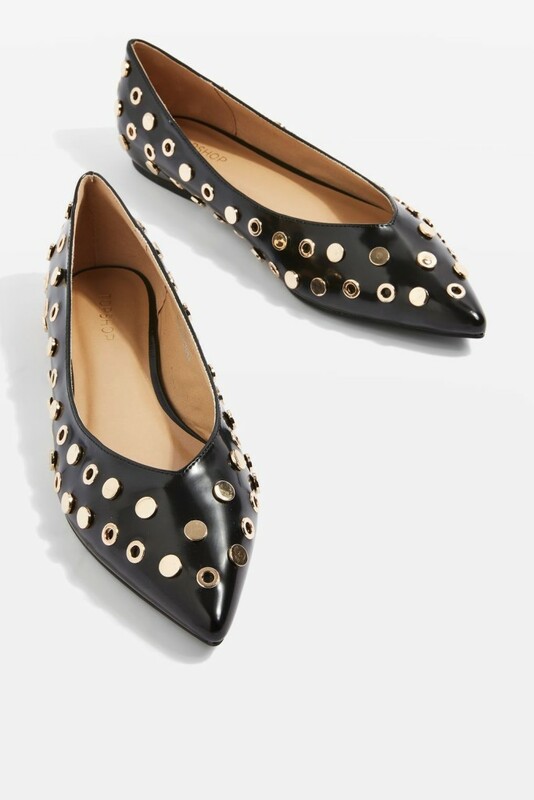 And I kind of think I’d wear these quite a bit come September… so these get a bit thumbs up from me and have been added to the wishlist! This is the ‘off-white’ colour in the blouse, and the composition of the fabric is described as ‘flowy fabric, satin finish’… which I’m sure means, synthetic fabric with a nice drape. 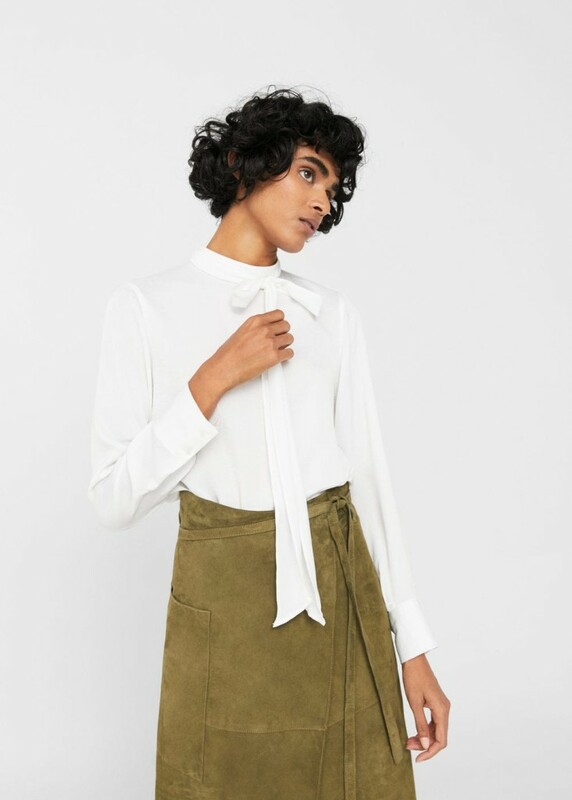 Anyway, I think it’s a good price for this style of blouse which works well with jeans and a blazer, under dungarees or would equally be at home with a smart skirt/trousers for work wear. Although from these online pics, it’s hard to see the difference really, isn’t it? 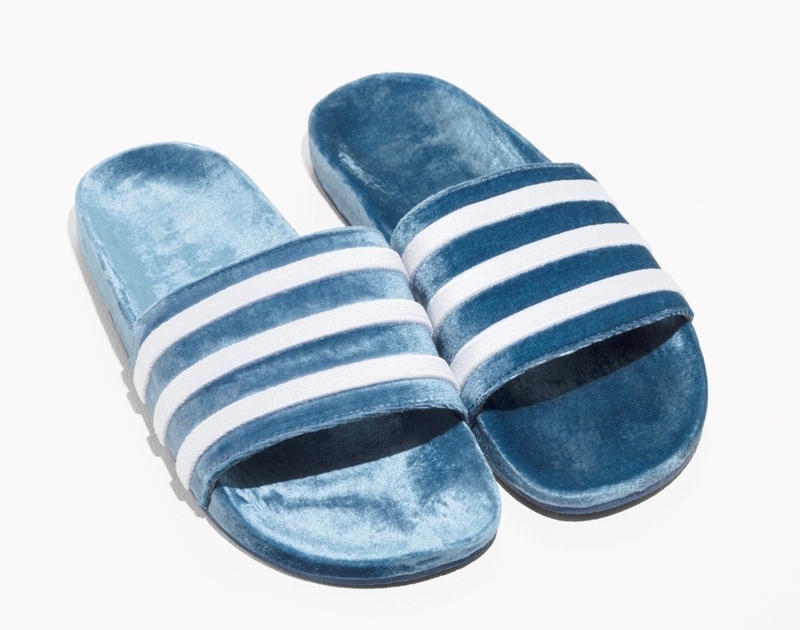 I love my plastic adilette slides although I know they are a bit marmite… but as I’m in the “love them” camp, I had to include these velvet, plush looking adilettes… I can’t imagine wearing them out of the house in our British weather, but I just kinda love them. This is a bit on the streep side for my budget, but the knit popped up on my instagram feed, which led me to the Uterqüe website for a closer look and unfortunately, I do like it. It’s the price which is the ‘unfortunate’ bit, in case you were wondering. I love the styling here, but I can imagine the knit looking great with denim, leather leggings… it’d probably work really well with a white shirt or heat-tech roll-neck under it as well. I’m not going to add it onto my wishlist… more onto my ‘dream-on’ for the moment list. I’ve been on the hunt for an easy to wear red summer dress for eons! This seems to tick all the boxes… well nearly all: I’d prefer the dress to have short sleeves… but I’m seriously tempted. I think it’s the rich colour of it which I’m sucked in by: what do you think? I think this dress would look lovely with a comfy, slouchy grandad cardi and ankle boots for early Autumn… the length of course would be longer on me, but I think I would prefer the longer length. Should I just bite the bullet and order it? This is one of those funny length (for most), slouchy sweaters which isn’t fully cropped, but perhaps too short for most tastes. 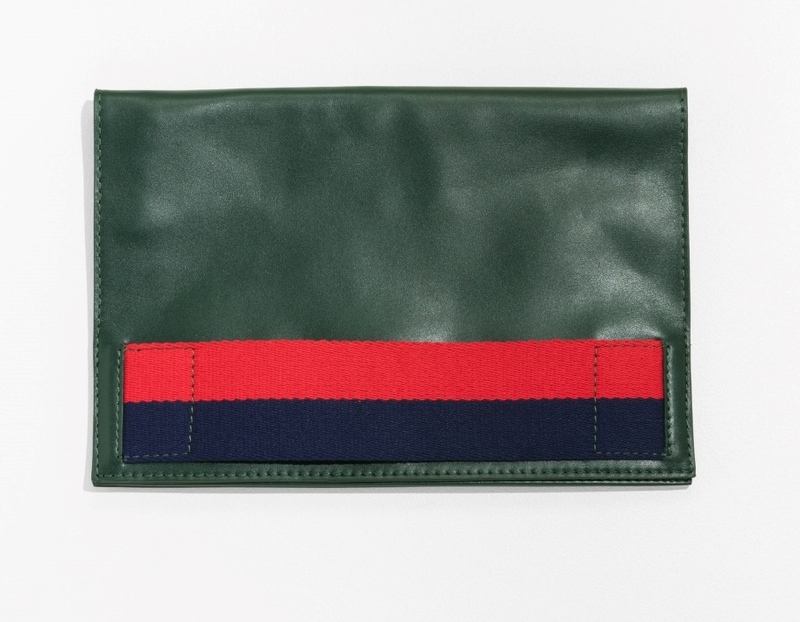 For us shorties however – it’s perfect! There’s a bit of sparkle, the loser hem at the bottom gives it a laid back look which is flattering over jeans or skirts… but again, the £85 price tag is a bit steep for what it is. Or is that just me being a skint-flint? Nothing else to say – other than: want one! Think I may be having a green moment, don’t you? 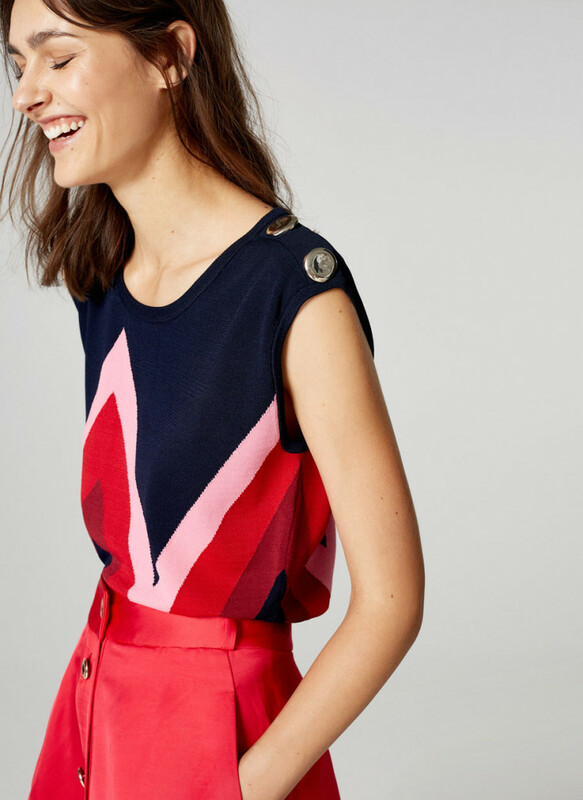 Adore this little blazer, though sadly, it wouldn’t be little on me… although it comes in the full spectrum of sizes from XS – XXL, with Zara, you just never know until you try – do you? I don’t have a Zara in town (which is kind of lucky for my bank balance) but I’d love to try this on… you know… just to see?! 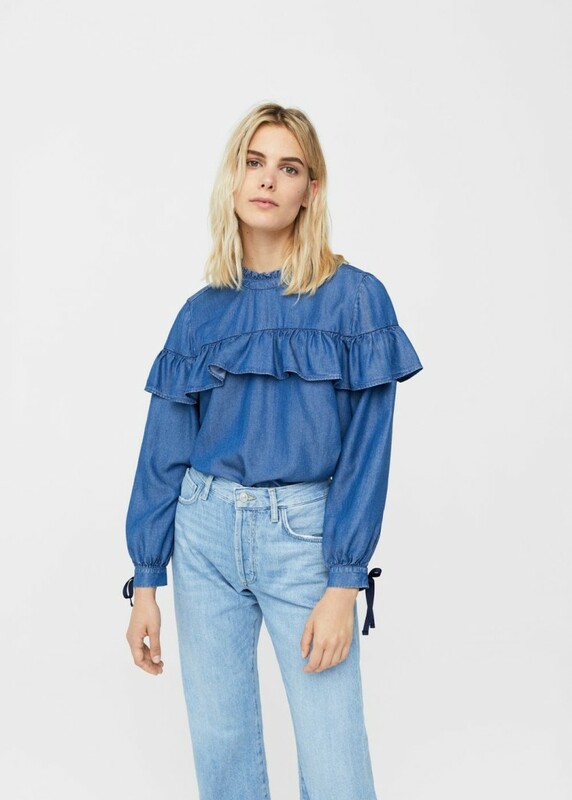 Now this is a bit of a funny one… I can imagine this frilled shirt looking lovely on a great many people and that it will appear all over my Instagram feed pretty soon. However… for my no-shouldered, petite frame… that frill would swamp me and look terrible on me. And because I can’t buy it and wear it… it’s being awarded stinker of the week! 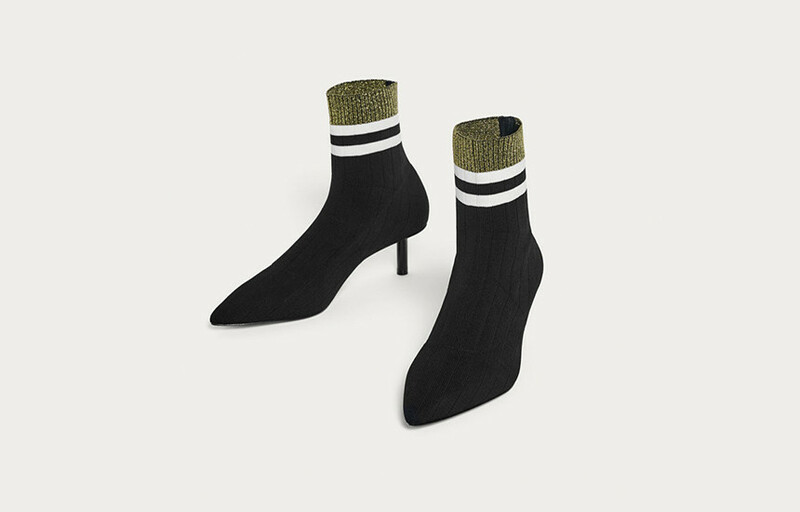 So these little sock like ankle boots, with the ‘sport sock stripe’ are right up my street: love them! BUT… I can imagine these are NOT everyone’s cup of tea. Look 3 – Yin and Yang: The boots would look lovely with a plain black dress, or pencil skirt… but would look equally fabulous with this Zara Long Floral Print Dress (£39.99) and then just go for a classic, hardening up of a floaty dress Zara Biker Style Jacket (£99) over the top: the perfect Yin and Yang partners. 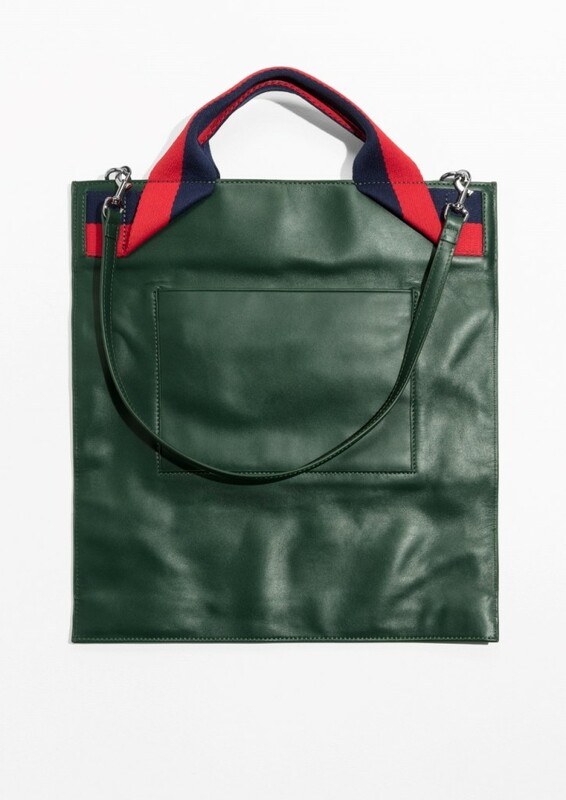 Just add a Topshop Premium Leather Sling Bag (£70) over your shoulder and you’re set. And so that’s it for this week’s Sunday 7. I was supposed to be going to a hen-do in Liverpool last night, but in fact, right at the last minute I found out that there was a second hen-night planned for September in London which would be far more cost effective in terms of rail fares and travel times would be halved so I bailed on the Liverpool night in favour of the London date… which was a huge relief given the week I’ve had with builders and poorly elderly parents in this first week of school holidays. Been visiting my in-laws in Leamington over the weekend which has been nice as they tend to swoop in and take over the childcare so a much needed mental break from the “mama-mama-mama’s” – love my mother-in-law: she’s just brilliant! Head home tomorrow on the 2 part train journey with the boys which will hopefully be fine but until I get home… I’m ignoring the thought of packing for my forthcoming 2 week holiday! So, over and out from me for now… would love to hear your thoughts on my choices this week… anything catch your eye? I can’t stop thinking about the sock boots!